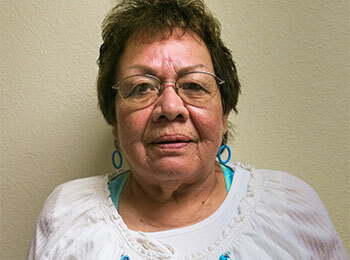 Paulette loves her work with Native American youth. My name is Paulette and I work at the Child Services Center for Cheyenne River Indian Outreach in Eagle Butte, South Dakota. The kids here call me “Grama.” I worked in the kitchen at the local school for almost 20 years. I love to work and I love children, even though I have rheumatoid arthritis. I love working here because I get to talk with the youth and treat them like they are special (because they are!). I treat them with respect, and in turn they treat me with respect. I have spent time teaching them how to crochet and just sitting and visiting with them, sometimes over a cup of coffee. They tend to really open-up and trust our conversations … they can talk and talk. ☺ One girl here has had a hard time opening-up and communicating due to severe PTSD and other traumas she has had to face, but she will visit and visit with me about, well … just about anything. I love this job — it is very rewarding.